Skiing and snowboarding are favorite winter / spring activities around Enumclaw and its proximity to outdoor adventure affords an abundance of opportunities. Crystal Mountian Resort, Washington State’s highest ski resort is just a quick forest lined drive up the Chinook Scenic Byway. There guests can enjoy 11 lifts, a cherry red gondola, a jib park, the state’s highest restaurant, 2,600 acres of incredible terrain, and over 50 named runs. Taking Crystal Mountain’s Mt. Rainier gondola is a great way to experience the resort, even for non-skiing/boarding visitors. Mt. Rainier is only 12 miles south as the crow flies, and on a clear day this ride offers visitors a view of the mountain that can’t be beaten. The resort offers free lift tickets for up to two children 10-years-old and younger, with a paying adult. They also offer a beginner ski or snowboard package that includes rental equipment, group instruction, and lift tickets. These lessons are first come, first served, so simply show up the day you’d like to participate and sign up at the Snowsports sales desk. The first visit includes a four-hour group lesson, equipment rental, and a Discovery lift ticket to learn the basics. Crystal Mountain Resort also rents snowshoes and on Tuesdays airline employees ski free with ID. The resort is part of the IKON pass system which offers discounted tickets to 38 destinations across the US. Don’t have your own equipment? Enumclaw Ski and Mountain Sports has downhill and cross-country ski, boots and snowboard rentals (bike rentals in the summer). Use its online order form to expedite the rental process. On the way up or back, make a stop at Wapati Woolies in Greenwater to check out its specialty hats and souvenirs. After a day of snow fun enjoy dinner at one of its independently-owned restaurants, take in a first-run movie at the Chalet theater and enjoy a comfortable night rest at one of the local hotels. Crystal Mountain is Washington’s largest ski area. A gondola and 10 chair lifts provide access to 3,100 feet of vertical and 2600 acres of terrain suitable for beginners and experts alike. 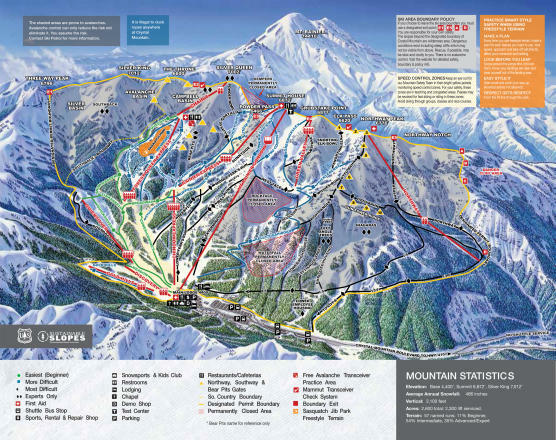 Location: Crystal Mountain is located 39 miles from Enumclaw via Highway 410, and 12 miles northeast of Mount Rainier.